Pendant Necklace with Larimar and Sterling Silver 925, "Heaven on Earth"
The heavenly blue hue of larimar steals the show in this pendant necklace from Aparna in India. Larimar is a rare stone, found only in the southwestern Dominican Republic. The cabochon gem is set in a bezel of sterling silver with heavenly ray-like details. The pendant centers a sterling silver cable chain. Aparna credits genetics with her passion for jewelry. Her father was a jeweler and she married a jeweler with whom she has built a successful jewelry workshop. Aparna designs and her husband is in charge of crafting and production. They draw on traditional designs for inspiration and employ traditional jewelry making techniques to create their unique collection. In their workshop, they train their helpers to integrate traditional jewelry making techniques with contemporary design. Aparna and her husband set up their own workshop nearly a decade ago. It has grown and they are now able to provide jobs for other jewelry artisans. Aparna provides for the educational needs of her two children and assists other family members with educating their children. Aparna provides for her two children and also assists other family members with providing for their children. More than I had hoped for. Perfect size and the color of larimar is oceanic. Excellent workmanship. Beautiful pendant. Thank you. This piece was a winner. I love the stone and the design of the pendant. I am looking forward to my next Larimar and probably will check Aparna's beautiful work again. 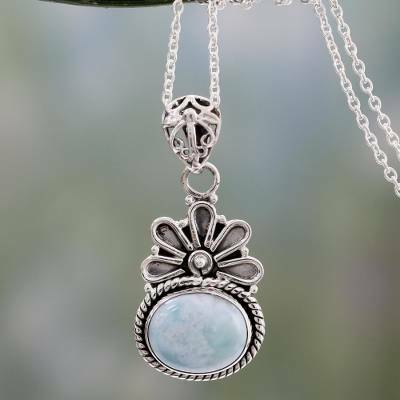 "Larimar "Heaven on Earth" Pendant"
I love the stone Larimar and the setting is very unusual adding a big statement in a small, beautiful piece of jewelry. Very pleased! I had been looking for Larimer for a while. This caught my eye because of the details in the sterling silver and how the stone is cast in the pendant. Beautiful color stone and wonderful craftsmanship! Just gorgeous! They are like looking at the sun, just gorgeous. Aparna made a lovely pair of earrings. The craftsmanship was marvelous. I love the Topaz and sterling silver ring, 'Celestial Bliss'! Thank you for making beautiful women's rings available in larger sizes. The detail is amazing; the color of the ring daces in the light. Thank you for sharing your artistic gifts, Aparna!